There are fewer utility workers today than there were 25 years ago, a union representative for line workers at NB Power says. Smart meters would make it easier for line workers to locate outages on a smart grid, which would also reduce the length of power outages in New Brunswick, a union representative for line workers at NB Power says. NB Power's plan to buy 350,000 meters was rejected by the Energy and Utilities Board earlier this year. The $122-million smart meter program would have wirelessly connected to the utility's smart grid and calculated energy usage more accurately, while also allowing customers to plan their energy use better during the day. The plan was rejected because the utility didn't have a strong enough business case. 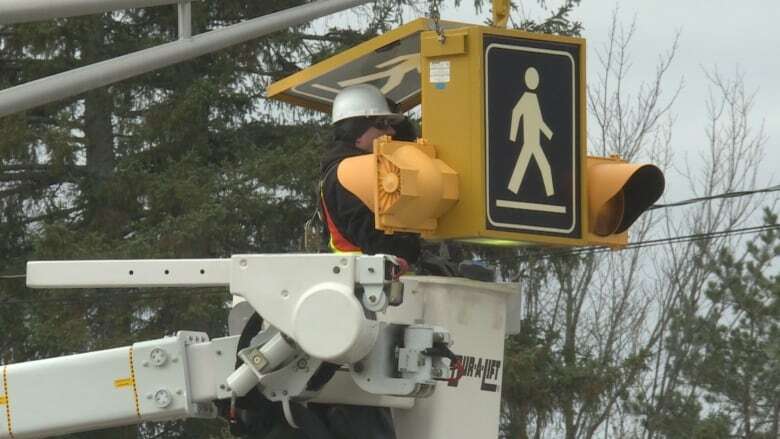 But Ross Galbraith, the business manager for Local 37 of the International Brotherhood of Electrical Workers, said it's difficult now for crews to determine where the cause of an outage is located in the aftermath of storms such as the one that hit New Brunswick on Saturday. About 100,000 NB Power customers lost power when fierce winds blew trees and branches onto power lines in parts of the province. Galbraith compares the current system to an old set of Christmas tree lights that don't work because there's a single bulb out somewhere on the string. The time-consuming challenge is to find which bulb it is. "As the system evolves to a smart grid, you know exactly where those outages are, and you can plan the work better and restore power more quickly," he said. Although there are now 25,000 kilometres of power lines across New Brunswick, there are also fewer utility workers today than there were 25 years ago, Galbraith said. Thousands of NB Power customers were still without power Tuesday almost four days after a powerful wind storm. The winds on Saturday knocked out power to roughly 100,000 households. Close to 300 crews from New Brunswick and outside the province have been working to restore power. "When we have fewer boots on the ground here, it does mean that it's a bit slower to get back at things," Galbraith said. With 60 per cent fewer line workers, he said, NB Power relies more heavily on utilities in surrounding regions after damaging storms. "That can work pretty good, except when you have a big massive storm, or when it looks like a storm might hit a neighbouring jurisdiction," he said. "Those utilities are reluctant to free up their workers to go assist somewhere else until they know what they're dealing with." He described the damage from the weekend storm as "absolutely incredible" and said crews were working between 12 and 14 hours a day in poor conditions to restore power. He said weather has also become more significant over the past 10 years, resulting in a lot of destruction on the system. "They're absolutely massive trees that have come down. [In] a lot of cases, they have crushed the infrastructure, they've broken wires, they've broken poles off, and that damage is very hard to fix. "It's not a 15-minute fix." Although he called NB Power's system "fairly reliable," he said it's having a hard time responding to the new severe weather conditions experienced across Atlantic Canada. Earlier this week, NB Power president Gaëtan Thomas, said he will be approaching mayors across the province about expanding rights-of-way. In recent years, New Brunswickers suffered some of the longest power outages during post-tropical storm Arthur in July 2014 and during the ice storm in January 2017. Thomas said NB Power is already four years into a seven-year tree-trimming program that has cost tens of millions of dollars and will help reduce the number of power outages. Galbraith said the process is taking some time, especially with the severe weather conditions year after year. "You might trim back a right of way 15 feet, but when a 40-foot tree falls, it's taking everything down," he said.